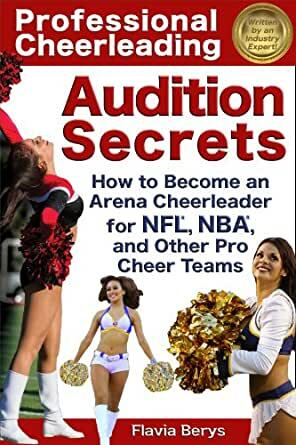 Professional Cheerleading Audition Secrets: How To Become an Arena Cheerleader for NFL, NBA, and Other Pro Cheer Teams - Kindle edition by Flavia Berys. Arts & Photography Kindle eBooks @ Amazon.com. Read this #1 Amazon Best Seller for Auditions! Do you watch professional sports with one eye on the game, and the other on the beautiful, glamorous and energetic cheerleaders? If you picked up this book, then you dream of cheering on the sidelines at an NFL®, NBA®, or other professional-level sporting event. You love dancing and sports. You have enough enthusiasm to excite hundreds of thousands of fans in the arena. You can’t wait to hear the roar of the crowd and dance under the bright lights. You can already imagine what you’ll experience as a member of an elite squad of amazing cheerleaders. And you want to make that vision real! Either you are someone sitting on the sidelines, feeling too nervous and unprepared to even show up at an audition, or you are someone who has already tried out for a pro dance team but was not selected. If either of those apply to you, I have great news! This book will break down the pro dance team audition process to give you the courage and confidence to show up on the day of auditions, as well as critical success tips to help you get selected. I’m here to help you make it onto the team of your dreams! I have over 20 years of experience in the cheerleading industry, including two years as an NFL cheerleader, and many years directing professional cheerleading teams in the US and overseas. I have made a career out of training and advising cheerleaders, cheerleading coaches, and pro dance team directors in several professional sports leagues. I have judged at more cheerleading auditions than I can count, and have even been an expert witness in cheerleading-related lawsuits. Whenever I sit at the judge’s table at a professional dance team audition, I know EXACTLY what we look for. I have seen successful candidates do everything right, and other women do everything wrong. It takes so much more than a smile and good dance technique to make it into the big leagues! Whether this is your first audition or your 20th, I promise you will find my advice valuable and essential. Some of it may even surprise you. I will share the secrets to image, weight loss, fitness, and beauty that few people outside of the professional entertainment industry know. I will even tackle the uncomfortable topics of racism, ageism, fat discrimination, and cosmetic surgery. Some serious myth busting will take place! Best of all, I will give you a solid action plan to help you achieve your goals. This book is divided into sections. The first section is the introduction, which you are reading now. In it, I tell you what motivated me to write this book (spoiler alert: you did!). The next section, “Is this sport for you?,” describes why you would want to pursue this goal, what the pro cheerleader personality “type” is in an ideal candidate. I also explore three of the biggest common myths about arena cheerleading. Next, in “Your research & advance prep,” I teach you why and how to prepare ahead of time, and what you need to research before the day of auditions. In “Your application,” I’ll teach you how to make your application stand out. The section titled, “Your audition day,” will take you through all of the elements of a typical audition and will teach you tips to help you do your best on the big day. The last section, “We are cheering you on!,” contains advice from other alumni pro cheerleaders who want to give you their advice to help you succeed. Flavia Berys is an author, attorney, real estate broker, and business consultant based out of Southern California. She works in the sports entertainment field as a consultant to pro-level entertainment & cheerleading squads. She is the author of Professional Cheerleading Audition Secrets: How To Become an Arena Cheerleader for NFL®, NBA®, and Other Pro Cheer Teams (Available on Amazon at http://amzn.to/VOAEmg). She is an experienced judge and organizer for professional cheerleading auditions worldwide. The Wall Street Journal, Fox 6 San Diego, KFMB Channel 8 San Diego, Muscle & Fitness Magazine, Woman's Digest, The La Jolla Light and other media have featured stories about Flavia's involvement in the world of dance and cheerleading. Her 20-year involvement in the sport includes three years as a UCLA Cheerleader, five years as an instructor for the Universal Cheerleaders Association (UCA), and two years cheering professionally for the NFL as a San Diego Charger Girl before taking her cheerleading career behind the scenes. 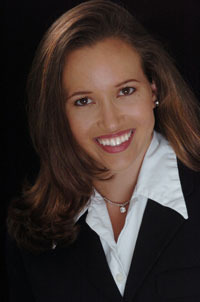 Flavia coordinated the promotional appearances and transportation logistics for the 2002 and 2003 NFL Pro Bowl cheerleading programs in Honolulu, Hawaii, where she had the opportunity to meet and work with cheerleaders from almost every NFL football team as an Associate Producer for e2k Sports. She was also hired by e2k sports to direct the San Diego Sockers Performance Team, a professional co-ed stunt squad, for two seasons. Flavia also directed and choreographed the halftime shows for the 2000, 2001, and 2002 San Diego Jr. Charger Girl Programs, and organized and administered a series of youth cheerleading clinics on the island of Guam. She was contracted by e2k Sports to travel internationally to Prague, Czech Republic, where she directed Eastern Europe's first professional cheerleading team, the Eurotel Cheerleaders, which was later renamed the Chilli Cheerleaders. She serves as the executive advisor to professional cheerleading teams such as the San Diego Enforcer Girls in the NPSFL football league. She has worked as an expert witness for trials involving cheerleading negligence litigation, and is the author of other upcoming cheerleading books, Pom Poms in Prague: A True Story and Professional Cheerleading: A Director's Guide to Starting, Managing, and Marketing an Arena Cheerleader Dance Team. In her spare time, Flavia enjoys horse polo, rock climbing, yoga, aerial circus arts, motorcycles, reading, and dance. A wonderful and thorough guide. Really has helped give me a focus on how to prepare for auditions! I bought this book last year when I was going to my first professional dance team audition and it definitely helped me in the preparation process. I had never been to an audition that was so big in that nature and the book helped ease my nerves that I was going to be as prepared as possible. Before purchasing it---I looked for audition tips online but nothing was as comprehensive as Flavia's book. Some of the chapters covered include: your audition attire, your look, how to build up your stamina and mindset, how to prepare mentally, how to research the team you're auditioning for and preparing your application. I definitely think this is a great book not only for beginners but also for dancer's that have been through the audition process before and that need to be reminded of how to fully present themselves on audition day! Love it! Some of the tips I had already known, but this book definitely provided me with more tips that I might need to help myself become a cheerleader. I've been wanting to get involved in an NFL cheerleading squad and I'm hoping some of these tips make all of the difference of getting noticed! I have had the pleasure to work with Flavia and she is an incredible woman. From the very first day that I met her I was inspired by her. I really wish I had this book to read when I was 18 years old going out for my very first Charger Girls audition. There are so many great tips and bios from so many professional cheerleaders. This book is very inspirational and will get you pumped and ready to go for audition season. I highly recommend all cheerleaders and dancers who aspire to become a professional cheerleader to read this book. Thank you so much Flavia for writing this book I know it will help and motivate so many women out there waiting to make it in the industry. Very informative. A good read before a audition! Helped me feel very prepared. I bought this book to help me prep for auditions and it covered every possible base imaginable. All my concerns and questions were answered and the author is amazing. She even discuss's things I would have never thought of! I have recommended this book to all of my dance friends and all the dance instructors I know. I cannot say enough good things about this book and the AMAZING work book that matches. I refer to this bad boy almost on a daily basis each time more confident for auditions then the last. Once again, FANTASTIC BOOK. I would pay hundreds for the level of comfort this book has brought me. LOVE IT. 5.0 out of 5 starsEverything covered and then some! I confirm Flavia's experience and credibility in writing this book! As a former teammate of hers, this book has been an exciting read because it brought me right back to the sentiments and actions I experienced during my audition process! She covered it all and then some. It is also extremely helpful to get tips and first hand experience from the active and alumni pro-cheerleaders! Whether you are thinking about auditioning for the first time or the tenth, This book helps prepare you emotionally, mentally and physically for the process and for the audition like nothing else! It's a must read if you plan on auditioning for any pro cheer team!